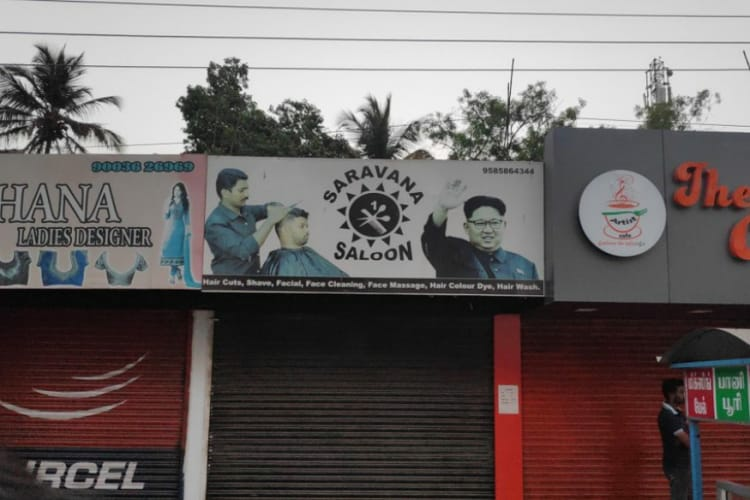 A local barbershop in Coimbatore, Tamil Nadu has North Korean leader, Kim Jong-Un as an advertisement on the banner for the shop. Ever wanted to make a statement with just your hair alone? While getting an undercut may be popular and 'in fashion,' and of course, dyeing your hair with an uncommon colour is sure to turn heads, you can perhaps stand out if you get a haircut that screams 'authority'. And nothing says 'authority' better than North Korean 'Supreme Leader' Kim Jong-un. Kim Jong-un, who rules an entire country in a dictatorship fashion, is known for his signature haircut, which you can now avail, in a shop in Coimbatore, Tamil Nadu. Posted by user u/the_tourer on Reddit India, a picture showed a board of a local barbershop in Coimbatore. 'Saravana Saloon' said the name of the place around the emblem. But what stood out, was the photo to the right - North Korean leader, Kim Jong-un. While seeing Bollywood actors like Hrithik Roshan, or Salman Khan on posters for local hairdressers may be common, spotting Kim Jong-un may not be your usual fix. Usually, these local hair salons which have these pictures also claim that they can recreate the look in the poster. Ironically, while you may be able to get Kim Jong-un's haircut in India, you can't get it in North Korea. The signature undercut, swept-back look of the 'Supreme Leader' can't be recreated, and you can only choose from 15 sanctioned hairdos. Kim Jong-un had started wearing his signature swept-back, undercut hair as a tribute to his grandfather, and North Korean founder Kim Il Sung. If you want this 'Supreme' haircut, the shop is listed on Google maps for easy access!